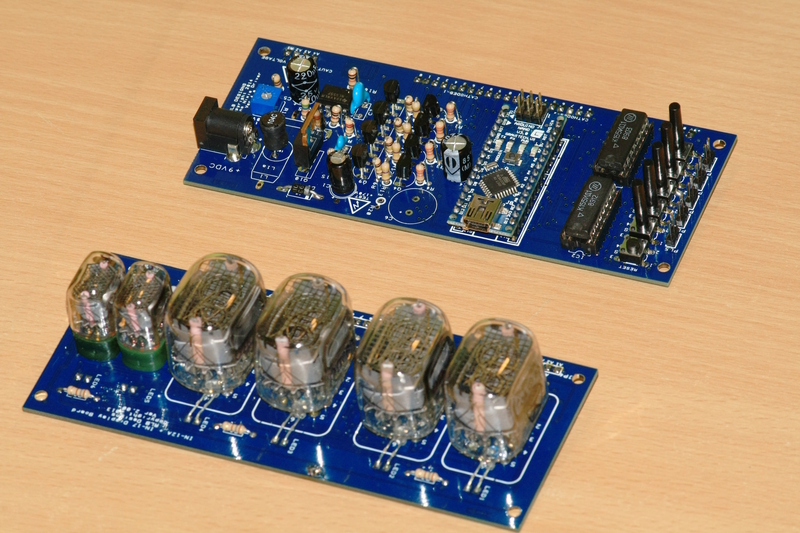 Robin Birtles, from Chessington, UK (RLB Designs), has been very kind in sending me one of his nixie clock circuits. 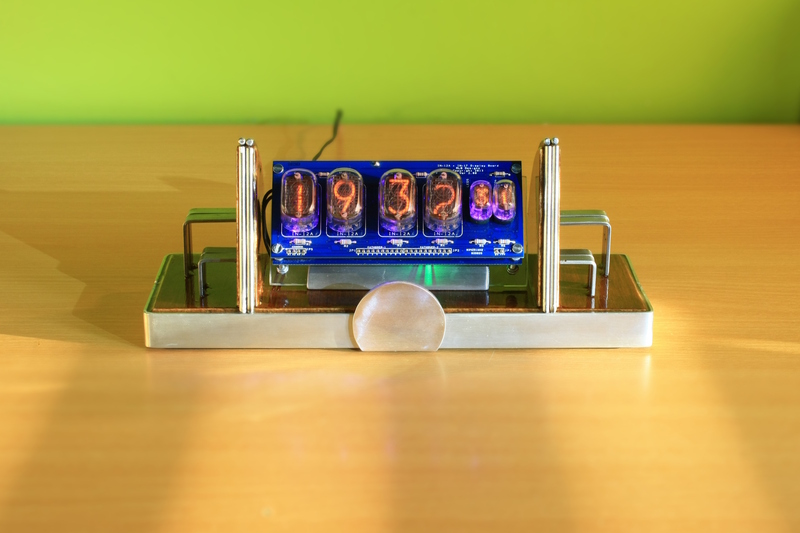 This neat, compact clock is powered by an Arduino Nano microcontroller and uses multiplexing with two K155ID1 drivers, lightning up six tubes, four IN-12s and two IN-17s. The power supply and driving circuit and the tube support circuit nicely stack into one standalone clock. 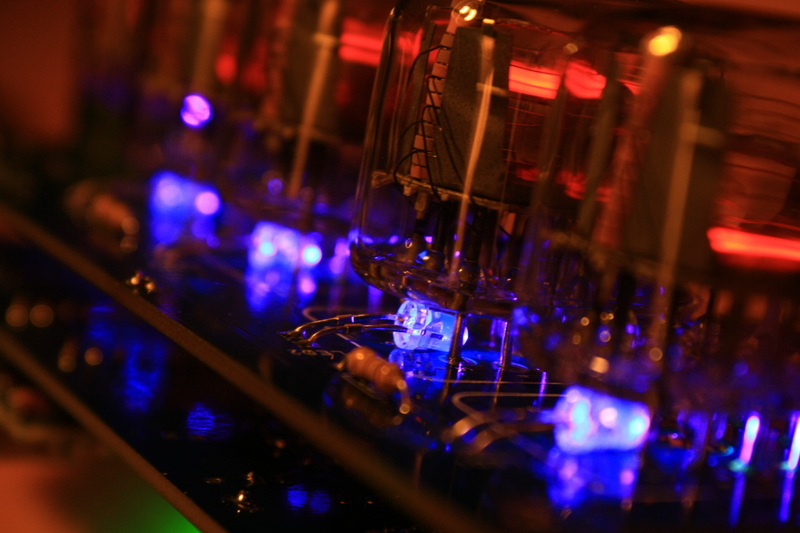 The tubes are backlighted by ultraviolet LEDs, which gives a very nice look to the assembly. The multiplexing structure as well as the source code are close to my IN-18 Nixie clock, and I had a hand in helping Robin perfecting his code. I also made the Art Deco-inspired cases presented at page 2. Total project cost (estimated) : 300 € per model. Note: If you're unfamiliar with nixie technology, I'd suggest you read this short introduction to the theory of operation on my IN-18 section. 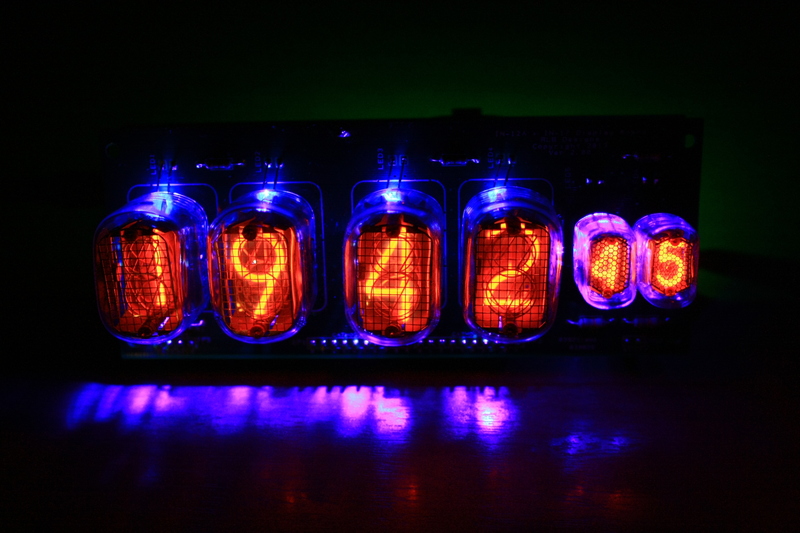 This clock uses two K155ID1 driver chips and relies on multiplexing to light up all the tubes at once. The whole clock is controlled by an Arduino Nano microcontroller, which is soldered onto the main board. High resolution pictures of the circuits can be found on the dedicated photo album. Figure 1.1 — Schematic of RLB Design's clock (v.5). Click on the image to download a PDF version ; right-click and show image for a larger resolution of this PNG version. Power supply :	The upper-left part of the circuit deals with supplying the nixies' anode with the correct voltage. Like most modern nixie clock driving circuits, it was designed on the switching power supply paradigm. The high voltage provided ranges from 90V to 200V and is adjusted by the VR1 potentiometer. Anode control : The upper right part is an array of transistors designed to control which of the anode will receive the power from the previous part, according to the multiplexing code. When one of the connected Arduino pin goes high, the transistor is activated and delivers the high voltage to the anode, at the exact same time the correct cathode is grounded in order to light up the selected digit, this is carried out by the Cathode Control. Cathode control : The third part simply connect the driver chips (K155ID1, 74141 equivalent) to the Arduino. These IC's are BCD to Decimal decoders have 4 inputs, which is more than enough to control 10 outputs (24 = 16 > 10), which correspond to the 10 digits of the nixies. Input control : Finally, the lower right part displays the pushbuttons, connected to some of the analog pins, configured here as digital pins. More informations about their function is given in the next page. DS3231 Real time clock : There's a built-in RTC on the latest version of the board, for a near-perfect accuracy in time-keeping. The RTC communicates with the microcontroller via the I2C protocol. The SDA and SCL are respectively connected to the A4 and A5 pins of the Arduino Nano, as shown above. Figure 1.2 — The two boards, shown here disassembled. Notice the Arduino Nano microcontroller on the upper board.